"Rates were essentially unchanged last week despite a weaker than expected jobs report," said Erin Lantz, director of mortgages at Zillow. "Although this week marks Janet Yellen's first congressional testimony as the new Federal Reserve Chair, we expect rates will remain fairly flat." Additionally, the 15-year fixed mortgage rate this morning was 3.13 percent and for 5/1 ARMs, the rate was 2.80 percent. 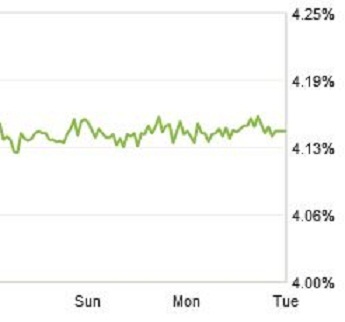 *The weekly mortgage rate chart illustrates the average 30-year fixed interest in six-hour intervals.